16 Days til Disneyland - Cozy Cone Motel! 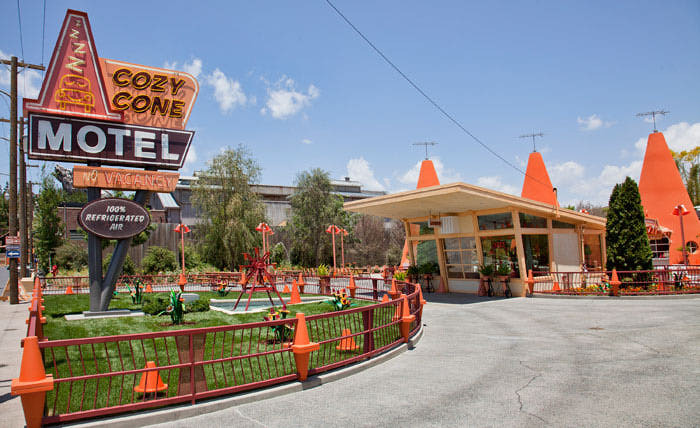 16 Days til Disneyland – Cozy Cone Motel! As we get closer to the day we leave for our trip, we start running into more and more things that are reflective of the areas that we have a lot of interest in. Today, for Day 16 in our countdown to Disneyland series, we are taking a look at the Cozy Cone Motel which, while not a motel like in the movie, still has plenty for us to enjoy — namely, some delicious ice cream! The unique backstory behind Cars Land is that the Radiator Springs Racers is the next big race, and it has come to Radiator Springs! As a result of the big race, Sally has converted the Motel into an eatery, featuring everything that you would find that comes in a cone, such as ice cream, chili “cone” queso, “route” beer floats, and even popcorn served in a cone! This uniquely themed area will be a stopping point for us during our trip. Is it a stopping point for you as well? Next Post: Wordless Wednesday – My June Calendar Shot!